The Cleopatra’s Pyramid Slot is a video slot game that is provided by the WGS software for playing the game online. The theme of the game is Ancient Egyptian related to Queen Cleopatra from the previous era. It has 5 reels and 20 paylines as this game is full of fun and amazement. The amazing graphics of the game provide you with an ancient and royal meeting with Queen Cleopatra who is known as one of the beautiful women in the world. Even the casino machine and Video Slots have relative theme symbols as Eye of Horus, Ace, Ten, Cleopatra, King, Sphinx, Jack, Queen, Sarcophagus, Nine, Totem and Scarab. 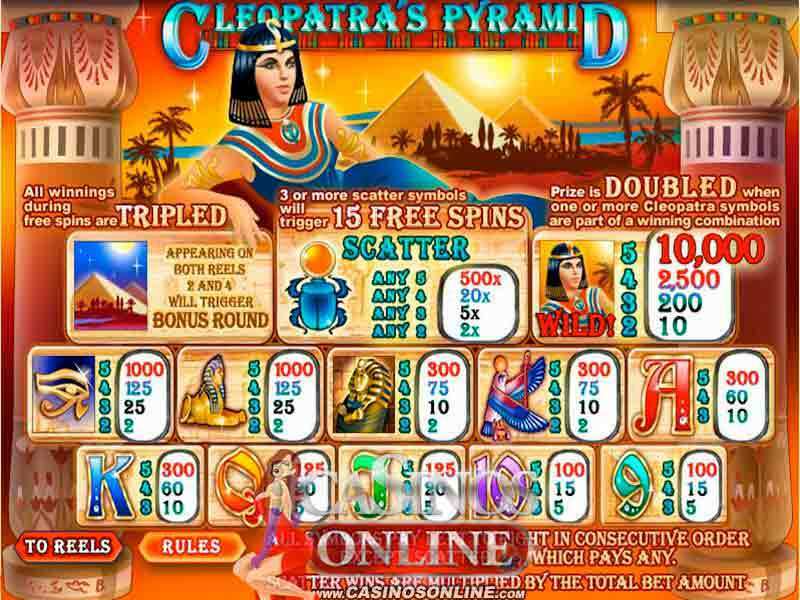 The jackpot is 10,000 coins, the player can get the wild symbol that is Cleopatra and the scatter symbol is Pyramids. The 15 free spins can be activated when three or more Pyramids are there on the reels. The Egyptian Slots are there in the game and the max bet that the player can play is of $200. The player should choose a prize in order to move to the next level and they can choose it from the Cleopatra Slots. As the Cleopatra’s Pyramid Slot game is set up under an ancient theme so it attracts many players though it has simple graphics. The adventurous game is full of enjoyment and it can help the players in winning some real money. The players should collect maximum number of coins in order to move to the next level and win prizes to move to the higher levels in this Egyptian game. 0 responses to "Cleopatra’s Pyramid Slot"
2 How to Play the Game?